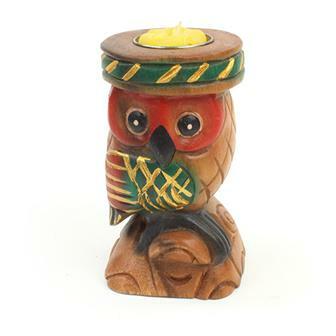 In this area we have a large selection of Fair Trade candle holders, from the elegantly simple to the wonderfully ornate. 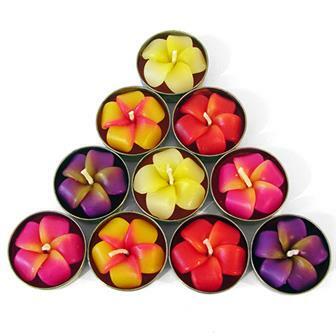 We also sell packs of our own brand of Thai flower t-lights. Handmade in Northern Thailand, these T-Lights have been sculpted into the shape of beautiful vivid flowers. Each pack contains ten candles in five different vibrant colours and come packaged in a recycled cardboard sleeve. 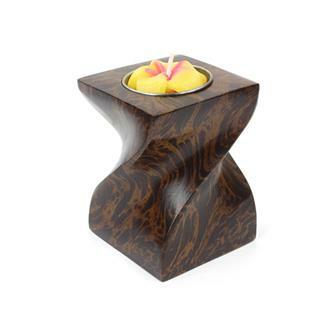 These fantastic twist tea light holders are made from natural mango wood with a smooth finish. This abstract design would look wonderful on any bookshelf! Mango wood is valued as an attractive, richly grained and sustainable wood. These carved mango wood t-light holders are hand-produced in India. The beautiful, natural wood grain is shown on each elegant holder and they are finished with a simple dark stain. 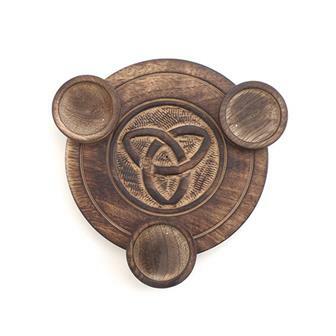 This centre of each holder is carved with a triquetra, a kind of Celtic triple knot. They make wonderful additions to any comfy, restful space. These carved mango wood t-light holders are hand-produced in India. The beautiful, natural wood grain is shown on each elegant holder and they are finished with a simple dark stain. This centre of each holder is carved with a traditional symbol of good luck across Asia, the trunk-up elephant. They make wonderful additions to any comfy, restful space. These carved mango wood t-light holders are hand-produced in India. The beautiful, natural wood grain is shown on each elegant holder and they are finished with a simple dark stain. 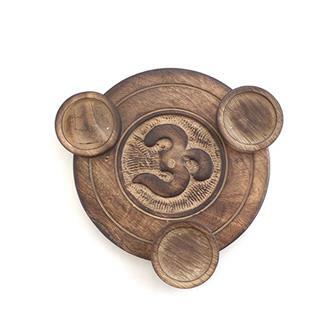 This centre of each holder is carved with the tradtional Om symbol, ॐ. They make wonderful additions to any comfy, restful space. 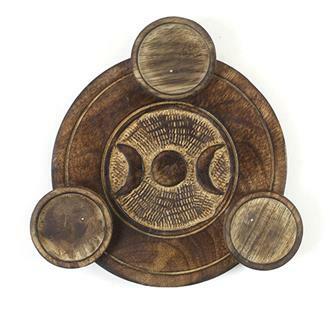 These carved mango wood t-light holders are hand-produced in India. The beautiful, natural wood grain is shown on each elegant holder and they are finished with a simple dark stain. The centre of each holder is carved with a Pagan symbol known as the 'Triple Goddess' or the 'Triple Moon.' They make wonderful additions to any comfortable, restful space. 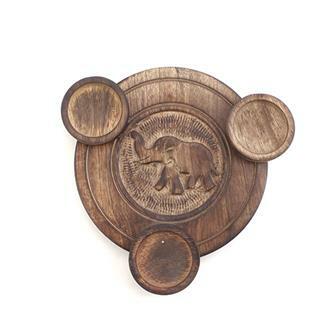 These carved mango wood t-light holders are hand-produced in India. The beautiful, natural wood grain is shown on each elegant holder and they are finished with a simple dark stain. 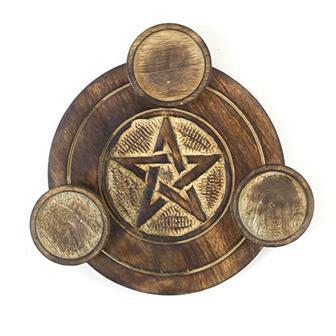 The centre of each holder is carved with a pentacle symbol. They make wonderful additions to any comfortable, restful space. These carved mango wood t-light holders are hand-produced in India. The beautiful, natural wood grain is shown on each elegant holder and they are finished with a simple dark stain. 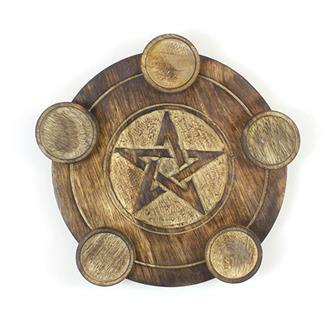 The centre of each holder is carved with a Pentacle design which is surrounded on each point with a space for a T-Light. 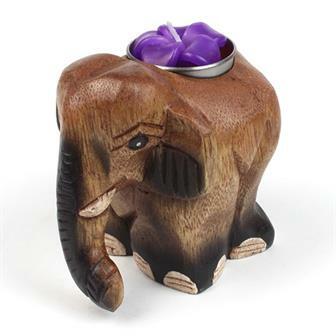 This beautiful elephant candle holder has been hand carved from acacia wood in the north of Thailand, near Chiang Mai. 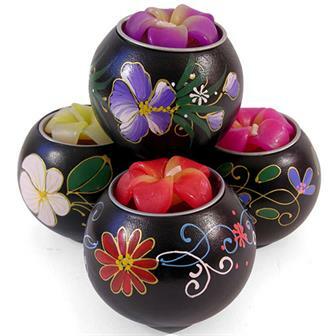 A symbol of good luck and prosperity in Thailand, each holder also comes with a beautiful carved flower candle. 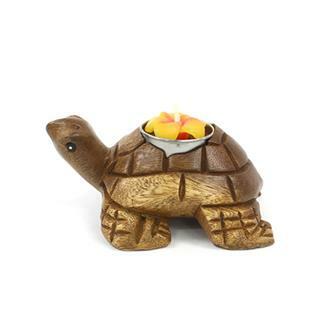 Lovely, acacia wood carving of a tortoise. Comes with one of our beautiful flower tea lights but the hole will fit all standard tea lights. 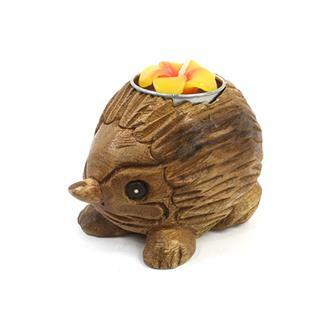 Handcarved in Northern Thailand, these hedgehogs are made from fast growing acacia wood. 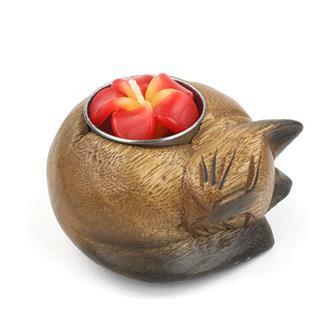 These awesome candle holders are perfect additions for an autumnal dinner party table. 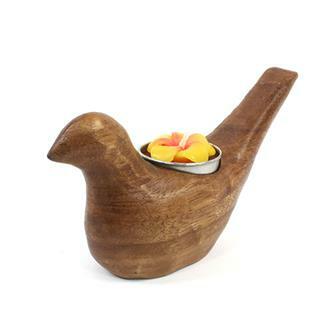 Hand carved in Northern Thailand, these smooth acacia woodcarvings of doves have each been drilled to fit a t-light. These lovely pieces make wonderfully simple decorative candle holders. 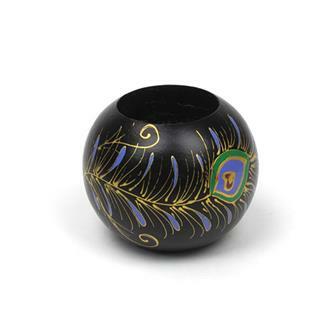 These solid turned wooden bases have been carefully painted with a delightful mix of vibrant and colourful floral designs, sold complete with a beautifully carved frangipani flower candle. These beautiful turned wood T-light holders are handmade and carefully decorated with a peacock feather motif in Thailand. 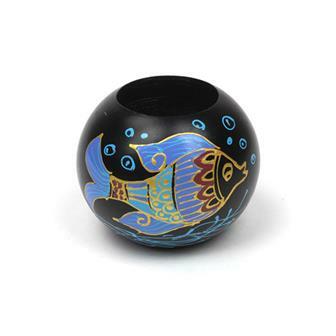 These beautiful turned wood T-light holders are handmade and carefully decorated with a friendly fish motif in Thailand. 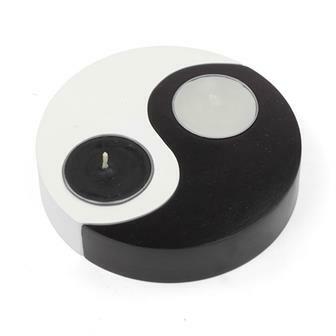 Attractive set of two candle holders with candles, that slot together to form Yin and Yang design. It symbolises two primal opposing but complementary forces found in all things in the universe. 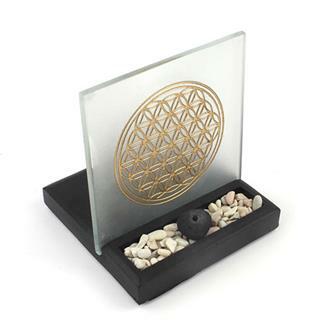 Elegant flower of life T-Light and incense holder with frosted glass screen decorated with a gold symbol, simple gravel display and sturdy heavy resin base. 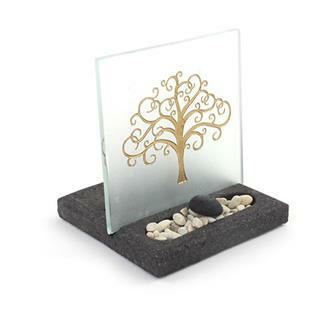 This neat little gift set can help to create a wonderful tranquil mood.